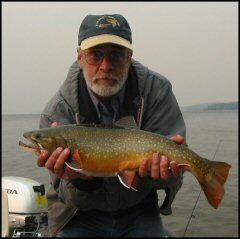 Lake Nipigon Fishing Charters Trophy brook trout, northern pike, lake trout & walleye. Lake Nipigon, traditionally a Mecca for speckled trout fishermen, still holds the record for the world's largest "brookie" which weighed over 14 pounds. Speckled trout fishing is at its best in the spring right after the ice goes out, and again in the late summer or early fall, when the trophy spawners return to shallow water. These beautiful fish exhibit their most vivid colouration during the fall spawning season. Lake Nipigon is famous for its trophy brook trout fishery--the reason is obvious when our customers take trophies ranging in size from 3 lbs. up to 6 lbs. 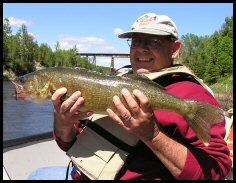 Because of the size of the lake and habitat variance (from rocky shoals to shallow river mouths), Lake Nipigon supports a variety of species other than brook trout, including large northern pike, walleye and lake trout. 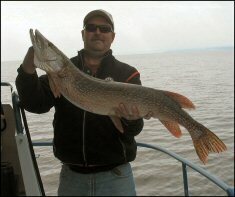 Monster northern pike inhabit shallow bays and river mouths. Each year, 20 to 25 pound trophies are taken. In the early spring clients have the opportunity to catch these large predators with fly rods. These northern "gators" present a real challenge for the avid fly fisherman. Besides spring fishing, the warm days of summer are an excellent time to angle these large "water wolves" using regular rods and lures. 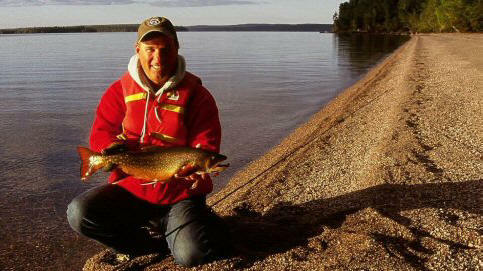 Lake trout, the king of cold, clear northern lakes presents an exciting angling opportunity. It has been said that the trout in Lake Nipigon are the fastest growing strain in Ontario. During the spring turnover of the water, the lakers move into shallow areas, and can be caught flat lining on light tackle. As summer approaches, these fish return to deeper and colder waters. Downriggers installed on our cruiser in conjunction with our LCD fish tracker allows us to continue fishing lake trout throughout the summer. 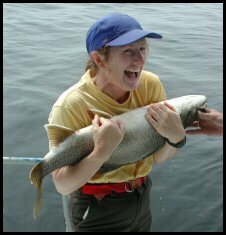 A 62 pound lake trout was the largest fish known to be taken from Lake Nipigon waters. Walleye are angled throughout the year, and are plentiful in several areas of the lake. Sizes range from 2 to 4 pounds. For inshore fishing, our 16 foot Lunds are equipped with comfortable seats and are powered by quiet, 9.9 Honda outboards. The motors are maintained regularly and are in good working order. Over the years, our clientele have developed a respect and reverence for Lake Nipigon and its unique and diversified fishery. Through careful conservation methods such as controlling the harvest, the use of barbless hooks and safe "catch & release" practices, we hope to protect and preserve this world class fishery for future generations.